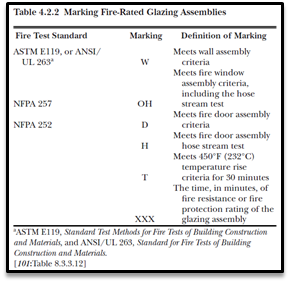 New table 4.2.2 Marking Fire-Rated Glazing Assemblies appears in NFPA 80 is excerpted here for your convenience. Note: In the footnote of table 4.2.2, the reference to NFPA 101 is shown as “[101:Table 8.3.3.12].” NFPA uses square brackets “[ ]” to indicate extracted content from a source document. In this case, the source document is NFPA 101, 2015 edition. Remember, the asterisk marking paragraph 4.2.2 indicates there is additional information in Annex A. Following the asterisk to paragraph A.4.2.2, we are referred to Table A.4.2.2 Minimum Fire Ratings for Opening Protectives in Fire Resistance-Rated Assemblies and Fire-Rated Glazing Markings. 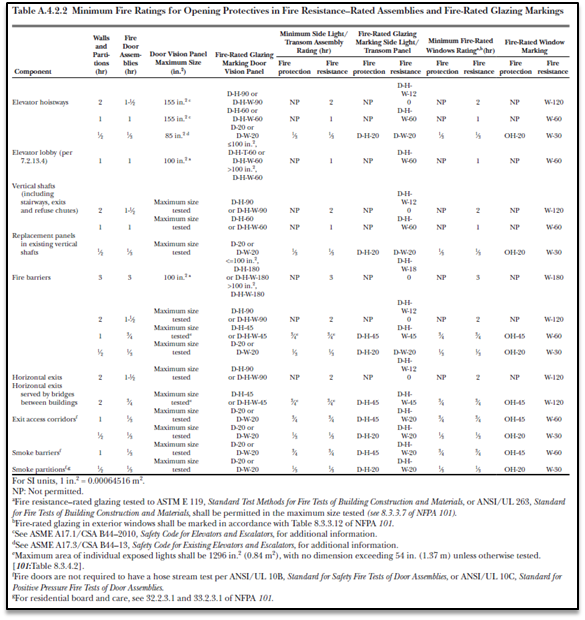 This table, too, is extracted from the 2015 edition of NFPA 101; it’s Table 8.3.4.2—see the footnote below. For the time being, Table A.4.2.2 will remain in Annex A since there are several differences between NFPA 101/5000 and the similar table in the IBC. Remember, Annex A’s content is explanatory in nature, not enforceable. Chapters 1 through 21, the main body of NFPA 80, contain minimum (mandatory) requirements that are enforceable. NFPA 80 has required individual pieces of glazing materials to be marked with a label, since the 1992 edition. At that point in time, the label was simply a marking or etching that indicated the wired glass (or other glazing material) was labeled for use on fire door assemblies. Later, the model building codes expanded on the information to be marked on the glazing materials, and it has continued to evolve ever since. Fire door assembly inspectors need to be aware that these markings are required. They also need to be aware of the marking requirements at the time the door assemblies were installed. Glazing materials installed prior to the application of the 1992 edition of NFPA 80 were not marked. They are still in use today. There is no requirement for a facility to replace unmarked existing glazing materials with new glazing materials that are marked. When replacing damaged glazing materials, new glazing materials are required to comply with the marking requirements that are current at the time of replacement (see 5.5.2 and 5.5.3). In earlier editions of NFPA 80, the only provision for using oversized fire doors required the AHJs to be consulted on the use of such fire door assemblies (see paragraphs 4.3.9 and A.4.3.9 in the 2013 edition). New provisions appear under Section 4.3.9* Oversized Fire Doors in the 2016 edition of NFPA 80. The first provision recognizes that some fire door assemblies are too large to be tested. These large door assemblies need to be labeled or have a certificate of inspection from an approved testing agency. Certificates of inspection issued by an approved testing agency need to “…state that the door conforms to the requirements of design, materials, and construction but has not been subjected to the fire test” (see paragraph 4.3.9.2). These new provisions codify the long-standing industry-practice when oversized fire door assemblies are used. Since NFPA 80 contains these new provisions, AHJs might approve the use of an oversized fire door assembly but you need to seek their approval in advance of installing one. Section 4.7 has a new title, it’s called “Actuation Devices for Fire Doors, Fire Shutters, and Fire Windows.” Automatic-closing doors need some form of a system that causes the door to close under fire conditions, and in some cases upon loss of power. Electronic detectors (e.g., heat and smoke) release the hold-open mechanism causing the doors to close. These detectors might be tied into “…a fire alarm, water flow alarm, or carbon dioxide release system” (see paragraph 4.7.1.1). Fail-safe systems close the doors when power to the detectors or release mechanisms is interrupted. Fusibile-link systems (usually consisting of cables, pullies, counter weights, and fusible links) are needed when the automatic-closing system is not fail-safe (see paragraph 4.7.1.3). Non-fail safe systems might include electronic detectors but the detectors and release mechanisms are not tied into the fire (or other) alarm. These systems need fusible links to ensure the doors will close in a fire. Fusible links systems might not be allowed in some applications due to the extended time it takes for the lead links to melt. Smoke passes through the openings until the links melt and the doors close. In applications where fire doors protect openings through which conveyor systems pass, paragraph 4.7.1.5 requires detectors to provide three critical functions that clear the openings and cause doors to close. First, they need to either “…stop the feed conveyor or otherwise initiate the mechanism that clears the path of the fire door.” Next, the actuation devices need to delay the closing of the doors until the opening is clear and unobstructed; the delay is limited to no more than 10 seconds. Lastly, the actuation devices need to release the automatic-closing or self-closing mechanisms. Horizontally-sliding, vertically-sliding, and rolling steel doors are used to protect these types of openings. The next two sections cover the installation of smoke and heat detectors. 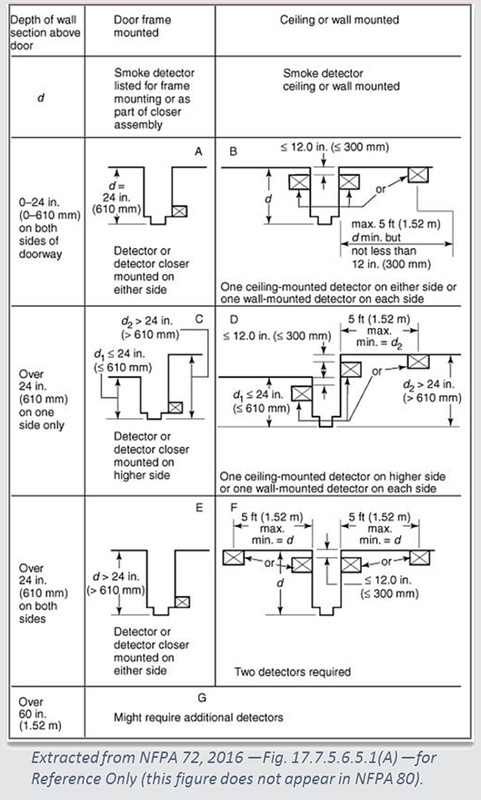 Section 4.7.2 Smoke Detectors requires smoke detectors to be located within specific distances from the door assemblies, “…in accordance with NFPA 72.” This is one example of how external reference codes like NFPA 72, National Fire Alarm and Signaling Code, add requirements to NFPA 80. 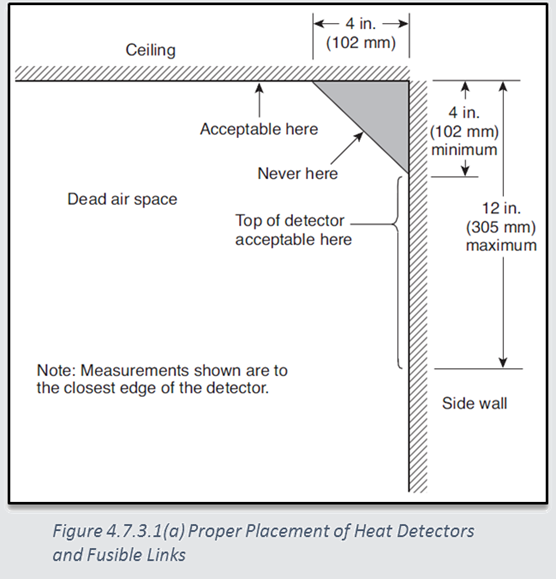 Figure 17.7.5.6.5.1(A) below shows the maximum distances for the placement of smoke detectors. Note that NFPA 72 recognizes the use of electrified door closers with built-in smoke detectors. Take time to study this figure closely, it shows a great deal of information. Section 4.7.4 Fusible Links covers the placement, location, and number of fusible links needed for door assemblies. Figure 4.7.3.1(a) illustrates where fusible links can be installed in relation to the intersection of ceilings and walls. Paragraph 4.7.4.2 requires fusible links to be placed on both sides of the walls where the door openings occur. These links are interconnected by a series of cables or chains that pass through a sleeve in the wall. Doors close when any fusible link melts. It bears mentioning that the fusible link systems covered in 4.7.4.2 are intended for horizontally-sliding, vertically-sliding, and rolling steel door assemblies (among others). This section does not address the use of fusible links on swinging doors with builders hardware, where fusible links are built into door closer arms—these types of door closers are rarely used on today’s buildings. A new provision for mitigating excessive clearances under fire doors is found in paragraph 4.8.4.2. It states. 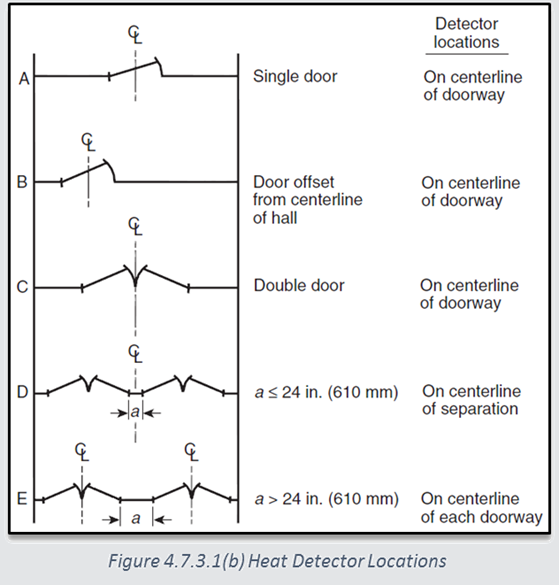 “Products evaluated for fire doors with a bottom clearance in excess of ¾ in. (19 mm) and listed for use at or under the bottom of the fire door shall be permitted where installed in accordance with their listings.” Excessive clearance under fire doors, particularly swinging doors with builders hardware, is one the most commonly cited deficiencies found during safety inspections of door assemblies. Concrete floors have high and low areas that are not level. The unevenness of concrete floors is most noticeable under fire doors. New products are being designed to reduce the clearance under between the bottom of fire doors and the floors. NFPA 80 recognizes the need for these new products and allows their use, provided they are listed for use on fire door assemblies. When the doors have latching hardware that extend into the floor below the door (e.g, flush bolts, concealed vertical rod bottom latches, etc. ), the new products allowed by 4.8.4.2 cannot interfere with the operation of the latching hardware. A subtle but important change occurred in paragraph 4.1.4.3. The words “fire protection-rated” were inserted before the word “glazing.” Earlier editions of NFPA 80 prohibited the placement of signage on all types of glazing in fire doors. 4.1.4.3 now specifically prohibits the application of signage on fire protection-rated glazing. In other words, signage cannot be applied to fire protection-rated glazing but it can be placed on fire resistance-rated glazing. Annex paragraph A.4.1.4.3 explains that due to the design of some fire doors and requirements for special locking arrangements (e.g., delayed egress), it is necessary to apply the required signage to glazing materials. In these cases, the annex comment recommends the use of fire resistance-rated glazing. Another change occurred paragraph 4.8.1.3. It states, “Door assemblies shall be used on walls of other construction where listed for such installation.” The word “where” was substituted for the word “if” that appears in earlier editions of NFPA 80. We’ve covered all of the changes in Chapter 4 General Requirements. Be sure to review each of these changes in your copy of NFPA 80 to better understand their context. Changes in Chapter 5 Inspection, Testing, and Maintenance are covered in the next article.